All students, and especially struggling writers, need daily writing instruction. They need a mini lesson that focuses on a writing skill. Simply having students write in a journal is not sufficient. They will just continue to write the way that they always have. The daily lesson does not have to be long. In fact, short lessons are best! Students become better writers with practice. Unfortunately, teachers like to talk. The ten minute mini lesson can easily become a 20 minute lesson. We have to cut down on the teacher talk and give students as much time as possible to write and implement the lessons taught during the mini lessons. If your lessons routinely run too long, try practicing ahead of time and eliminating any extra talk. Instead of teaching the different types of writing (narrative, informational or opinion) simultaneously, try teaching them in units. 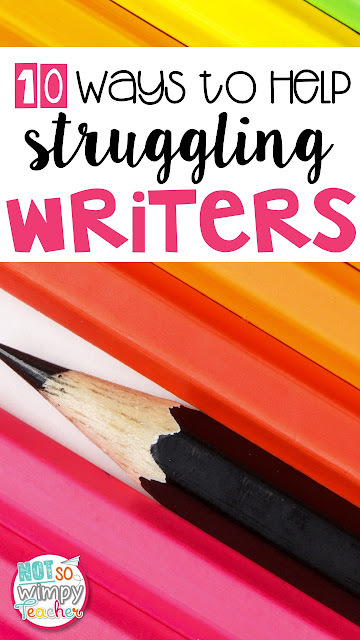 By really focusing in on the skills needed for one type of writing, you are allowing students to master skills before moving to another type of writing. When you switch back and forth between types of writing, students have a hard time remembering the skills. They tend to mix the skills and never really master them. Once you have taught a couple units, you can start spiraling with the occasional use of prompts and/or journals. Readers make the best writers. Show students what good writing looks and sounds like. I like to print passages that exemplify the skill I am teaching and have students put them in their writing notebook. They can reference this text when they are struggling with the skill and need a reminder of what is expected. Give students examples, anchor charts or other reference materials that they can go back to when they are independently writing, Struggling writers often forget the lessons we have taught and need a visual reminder. There are lots of fantastic writers who cannot spell. When you think about it, mechanics is typically just one small portion of the writing rubric. But, when the mechanics are terrible, we tend to assume the content is also terrible. Don't! If it's hard for you to look past the mechanics, have the student read their piece to you. Pay close attention to things like word choice, transitions, lead and ending. Conferencing with small groups of students, with similar goals and needs, will help all students to grow. Set up a system that allows you to meet with all students at least once per week. I split my students into five groups based on their writing goals. I meet with one group each day during independent writing time. When you are meeting with a group, focus on one goal or portion of their writing. For example, if you have just taught about dialogue, or if it is a common goal in the group, have students read one or two paragraphs that have examples of dialogue. Having students read aloud makes it easier to focus on content rather than just mechanics and it also keeps conferences moving at a good pace. Focusing on just one goal each time allows students to zoom in on a skill rather than getting overwhelmed. Students who enjoy writing are much more likely to improve as writers. Click HERE to read more about ways to make writing fun. My favorite way to really engage writers is to give them lots of choice. Allow students to choose where they want to write. Give them options when it comes to writing utensils and papers. Most importantly, allow them to choose what they want to write about. I teach writing in units of study. When we are working on our personal narrative writing unit, I do require that they are writing personal narratives. However, they can choose any topic they want. When the writer is invested and excited about the topic, they naturally grow as writers! Sharing your writing each day with a partner is motivating and gives students a chance to learn from one another. Giving students daily opportunities to share their writing will give them a reason to improve on their writing skills. Be certain that you have procedures for how students will share and how they will respond. Practice those procedures! Keep share time very short and give specific tasks to help students to stay focused. For example, "Share with your partner a place where you used the 'Show, don't tell' strategy." I have students pick three goals while they examine the rubric I fill out after their pre-assessment. Students glue these goals in their writing notebook so that they will be reminded of them regularly. Students will be learning many new skills during a writing unit, but it is helpful to have them focus on truly growing in specific areas. It creates student buy-in and supports a growth mindset. I also use the rubric to set goals for each student. These goals guide me during writing conferences. I hope that these tips help you to reach those struggling writers! If you are interested in my writing resources, check out the first unit in my writing product line. It includes EVERYTHING that a teacher needs to teach personal narrative writing. It has mentor text passages, anchor charts, lesson plans, printables, task cards and so much more!